County of Carmarthen: Conwil Cayo (2), Cylycwm (2), Llanddoysaint (2), Llandingat (3), Llanfair ar y Bryn (2), Llangadock (3), Llansadwrn (2), Llanwrda, Myddfai (2). County of Brecon Llandulas, Llanwyrtyd. The population falling within the Union at the 1831 census had been 14,799 with parishes ranging in size from Llandulas (population 159) to Llangadock (2,476). The average annual poor-rate expenditure for the period 1834-36 had been £5,317 or 7s.2d. per head. 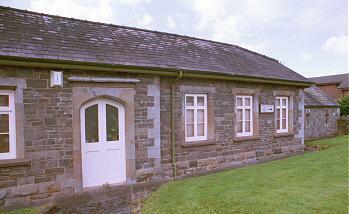 The Llandovery Union workhouse was erected at a site to the north of the town in about 1838. The Poor Law Commissioners authorised an expenditure of £3,000 on construction of the building which was to accommodate 120 inmates. The design of the workhouse was based on the popular cruciform or "square" plan with an entrance block facing onto the road at the east. To the rear, accommodation blocks for each class of inmate (male/female, infirm/able-bodied, etc.) radiated from the centre, forming yards between them. The workhouse location and layout are shown on the 1904 map below. After 1930 the former workhouse was used as a Public Assistance Instiution with a hospital being erected on adjacent land to the south. After 1948, the premises became a children's home until the 1960s. The western part of the site together with the hospital at the south then formed a cottage hospital, with the eastern section of the workhouse buildings being used as a council depot. Most of the former workhouse site is now occupied by a local hospital. The only surviving part of the original buildings is the eastern roadside block, with what appears to be an attached mortuary. This building is now used as a doctor's surgery. Llandovery front block from the north-east, 2000. Llandovery front block from the south-east, 2000. Carmarthenshire Archives Service, Parc Myrddin, Richmond Terrace, Carmarthen, SA31 1HQ. Few local records survive — holdings include: Guardians' minute books (1840-1930); Ledgers (1911-25); etc.